The best business people and managers understand design, and the best designers understand business and management. There has to be more cross-pollination. Warby Parker was founded with a rebellious spirit and a lofty objective: to create boutique-quality glasses at a revolutionary price point. The vintage-inspired eyewear company, named after two of Jack Kerouac’s earliest characters, is one of the coolest companies in business today. In fact, we felt cool just talking to co-founder Neil Blumenthal. He called it serendipitous that he met Jeffrey Raider, Andrew Hunt, and David Gilboa at The Wharton School in Philadelphia. When the fashion-forward friends realized that they were collectively complaining about the high price of glasses, they decided to do something about it. Neil said, “We saw this great opportunity to build a brand that reflects who we are, and answers or corrects the problems that we experienced. We would walk into an optical shop and get really excited about a pair of glasses and then walk out like somebody had kicked us in the stomach.” So, they built a company that brought the price of a $500 pair of glasses down to $95. 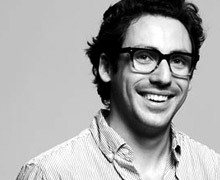 Warby Parker’s disruptive business model doesn’t stop with Buy a Pair, Give a Pair, or when they cut out the middlemen. The company places its customer’s desires front and center. Neil said, “When we thought about how we would want to buy glasses online, we knew that we wouldn’t want to pay shipping, we would want the ability to return products, and we would want the ability to try-on. So we created the Home Try-On program.” One of Warby Parker’s mantras is: “treat others the way you want to be treated.” Based on the company’s enthusiastic support from their 61,000+ followers on Facebook, the mantra has paid off. If you’re still not convinced that Warby Parker embraces a new type of business model, check out the way they’ve designed their 2011 annual report. Looking to upgrade your career’s cool factor? Check out their job postings here.